The Queen's Gallery has its origins in a painting competition held by Bangkok Bank, in which her majesty presided over the awards ceremony. There were so many quality entries it was felt that there needed to be a permanent home for contemporary art in Bangkok, which back in 2001 there wasn't. The bank donated the building and along with several other wealthy patrons the museum was endowed. 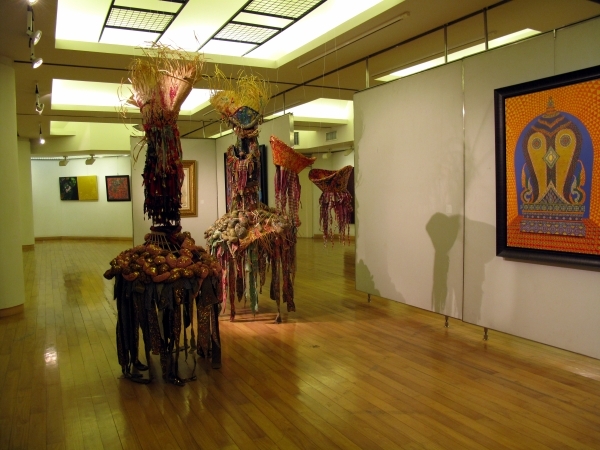 Some of the artworks on display in the gallery. The exhibits cover four floors and comprise both items from the permanent collection as well as temporary exhibits. There is an interesting mix of works in a very traditional style alongside some more avant-garde pieces, as well as some that mix the two. The galleries themselves are very traditional and tend to be quiet. The museum is open from 9:00 am to 4:00 pm every day but Wednesday. Admission is 30 Baht (0.78 USD). It is located at the Panfa Bridge area, in the Golden Mount area and across Rattanakosin Exhibition Hall.